On the heels of a successful event in Houston September 11th, Almo Professional A/V is preparing the next E4 stop, scheduled for the New York City/New Jersey region on October 8th (register here: http://www.e4avtour.com). The October event will draw on the success, and the new program features, that were first introduced at the Houston event. • Digital Signage Content & Distribution. 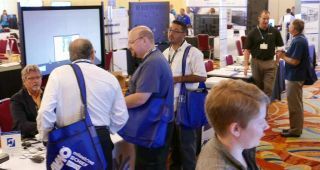 During this workshop, attendees learned how to create their own custom piece of digital signage content using Brightsign’s BrightAuthor software and then publish it via a network-connected BrightSign player. • BYOD & Collaboration. Attendees brought their own device to this workshop, to learn how to easily share content in a huddle room and a host of other ways– to extend AV to smart devices. They downloaded apps on personal devices to interact with Barco Clickshare, Kramer Via Collage, Samsung displays and other BYOD solutions.